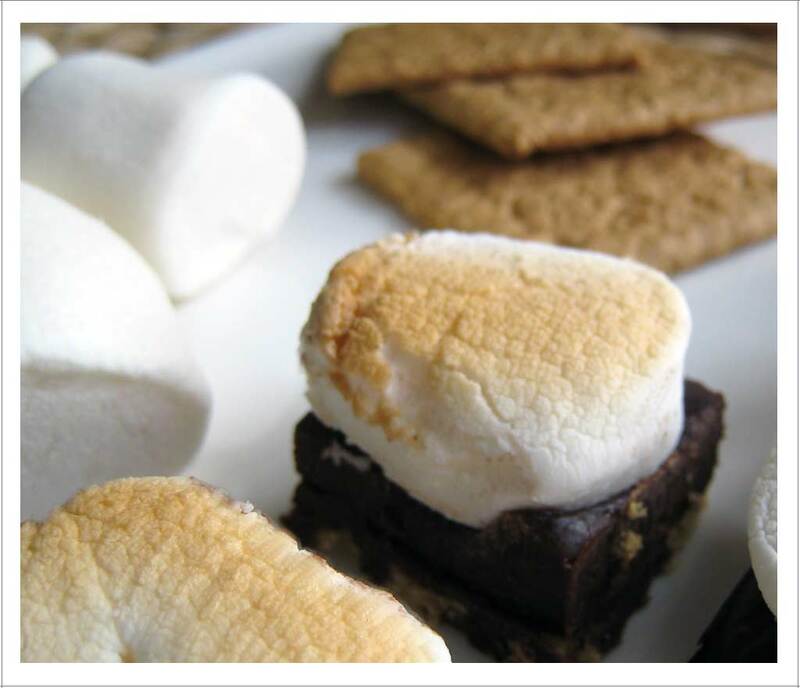 Flee Fly Mosquito – Fudgey S’mores | EmmaEats…and Katie too! Over the summer, G talked to Emma about camping. The conversation has come up a few times; I stay conspicuously quiet each time while the excitement between the two of them builds. I’m sure one of these times the conversation will lead to action, but hopefully, it will mean I won’t have to sleep outside among the bugs too. I’m also hoping that I might be able to share in the s’mores around the campfire. Also this past summer, we had the opportunity to have a fire on a few cottage visits. Emma and her cousins found themselves perfect toasting sticks while Nanna found them some marshmallows to roast. Although usually there were only marshmallows to be had, all of the grownups reminisced about s’mores and how wonderful they taste. We talked of it enough that Emma was very eager to get a taste of one soon. Then along came our stove breakdown after a trip back from the cottage. Since we had guests coming, I was on the hunt for a dessert that I wouldn’t have to bake. I stumbled across a no-bake fudge recipe which was so simple and quick and tasted incredibly rich. But it was too much on its own so we tried it with graham crackers which offered a great counterbalance to the rich creaminess of the fudge. And that’s when we decided with Emma to try and turn the fudge into Fudgey S’mores. She could finally try them but with a little twist. So simple. So creamy. And a little taste of summer – even though it’s definitely not summer anymore. Line an 8″x8″ cake pan with aluminum foil. Leave enough foil over the edges so you can lift out the fudge for cutting when it’s ready. Sprinkle the graham crackers over the bottom of the prepared pan. Set aside. In a microwaveable bowl, melt the chocolate on 50% power for 1 minute. Stir, adding in the condensed milk, vanilla and salt. Heat again for another minute on half power, then stir. If needed, continue heating and then stirring on medium power at 15 sec intervals until the mixture is smooth. Pour the mixture into the prepared pan and with a spatula, spread it out evenly. Work quickly – the mixture will start to firm up quickly as it cools. Sprinkle the marshmallows overtop and gently press them into the fudge. Set under broiler for 2-3 min until the marshmallows are lightly toasted. Refrigerate until cold and set, at least 1 hour. Cut into squares and serve. These make a fantastic gift – they look lovely when cut into little squares that fit half a large marshmallow and packaged up. You can increase or decrease the amount of graham crackers to your tastes. I like the texture with more graham crackers and they are a good balance to the creaminess of the fudge.